My 1990’s Terry Symmetry is a great commuting bicycle. It handles well and can keep up with the faster bikes on my regular commute. But recently I had been hearing an annoying rattle on the front end of the bike. Diagnosing bicycle noises while riding brings to mind Dante’s Inferno. As one’s thoughts spiral through endless ideas and related solutions, the bicycle itself seems drawn further toward complete annihilation, into the concentric circles of hell. After decades of riding, I have hopefully learned to pay more attention to the occasional odd and unexpected sounds coming from the bike I am riding. It’s almost always a good idea NOT to ignore them. Like most cyclists, I love and expect a certain silence from my bike. 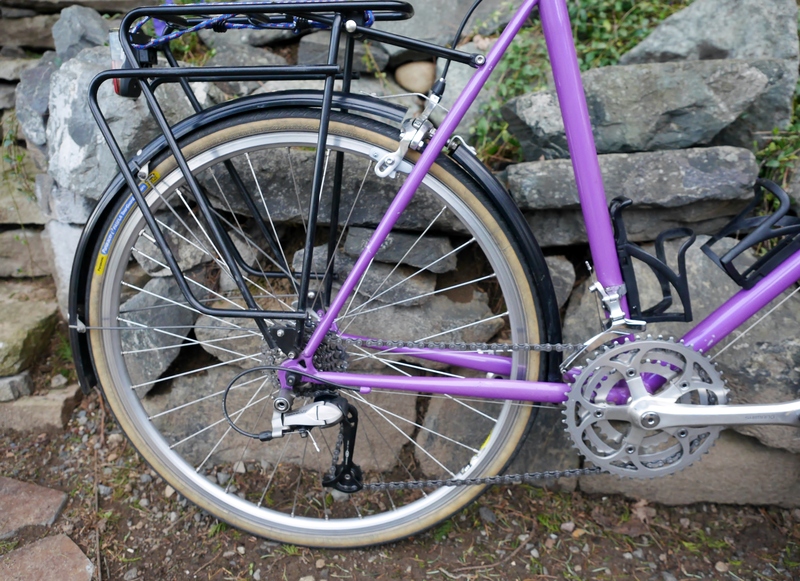 Encountering dry, squeaky chains, rattling fenders, and loose fitting luggage on other cyclists’ bikes weighs on my conscience: should I point out that their rear wheel is out of true or that a little bit of chain lube is in order? But that’s a question for another day. Front end rattles can be as difficult to nail down as noises coming from the center or back of the bike. In my case, because I had used an unusual mounting system for my fenders, my first thought was that the cantilevered portion of the front fender was bouncing around more than usual. After holding my hand over the front portion of the fender and hearing no change to the rattling noise, I realized that this wasn’t the problem. So, I continued my diagnosis while riding by holding my hand over different parts of the front end, to no avail. Nothing stopped the strange rattling noise. As it turned out, the culprit was a broken fender nut on the Bluemels “over the top” fenders that I had mounted on this bike. I had used all the original hardware on the stays, and paid no attention to how rusted the eyebolts looked. Finally, one of those rusted eyebolt nuts cracked, and that caused all the rattling. I didn’t really figure this out until I had: checked the fork for lack of play (there was none), checked the brake mount for a loose bolt (none), and checked the torque settings on the stem’s handlebar bolt and on the stem itself. All were in order. A process of elimination led me to the fenders. I removed them and discovered the problem right away when one of the nuts fell apart in my hand. I replaced all the hardware, and then decided to re-mount the fenders using these Velo Orange fender brackets, which are designed for bikes which lack fender eyelets (a sad truth of my 1990’s Terry). 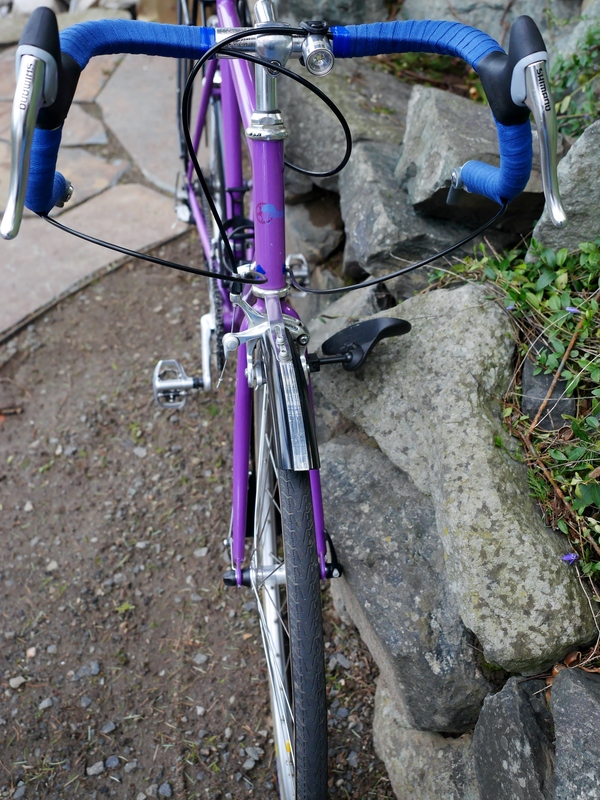 I had been using P-clamps to mount the fenders to the fork. The Velo Orange brackets, shown above, really clean up the front of the bike, but make front wheel removal more time consuming and finicky. 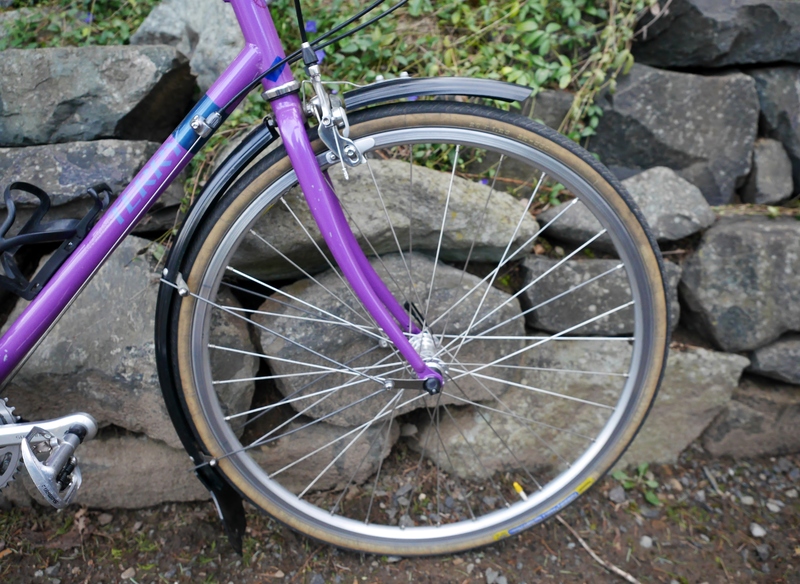 Fortunately, the rear drop outs of this bike have fender eyelets, so no brackets are needed on the back end of the bike. I’m glad I took the time to resolve this issue. A loose fender could have caused a crash. 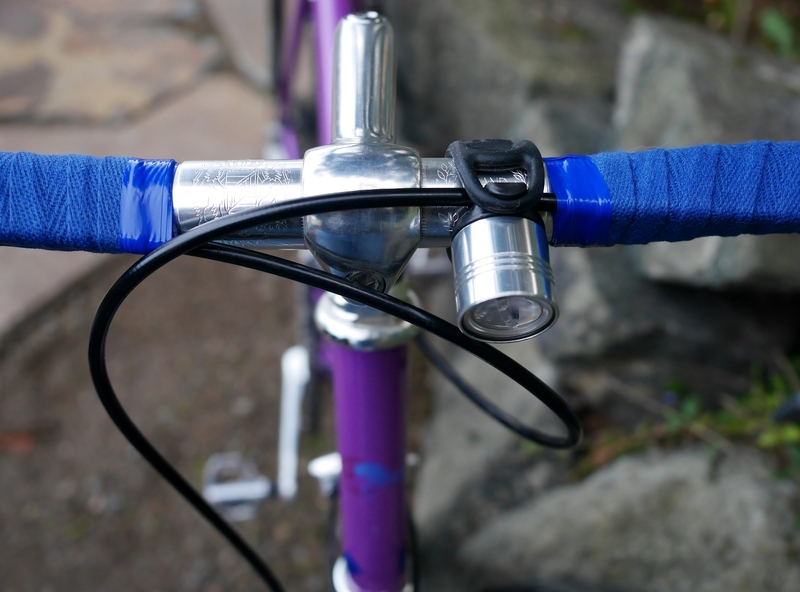 This entry was posted in Bicycle commuting, Bicycle restoration, city cycling, Commuter bicycle, Terry Bicycles, town bike and tagged Bluemels fenders, diagnosing bike noises, Fender, fender clearance by Nola Wilken. Bookmark the permalink. Oh boy did you nail it. The worst is an unfamiliar noise when you are expecting silence as you make your way down a quiet path. I have absolutely been in your position numerous times. Slowing down, speeding up, putting my head down low as my speed creeps to a walk. Trying desperately to find the awful culprit. What’s funny is I too typically track the issue down to fenders. Especially metal fenders. They seem to be the most temperamental. Nice sleuthing, Nola. I’m happy the issue was solved cheaply and easily. Also, what a wonderful Terry you have. Such great color and built up just right. I hope to catch you in the wild come one Portland afternoon! Thank you, Josh. 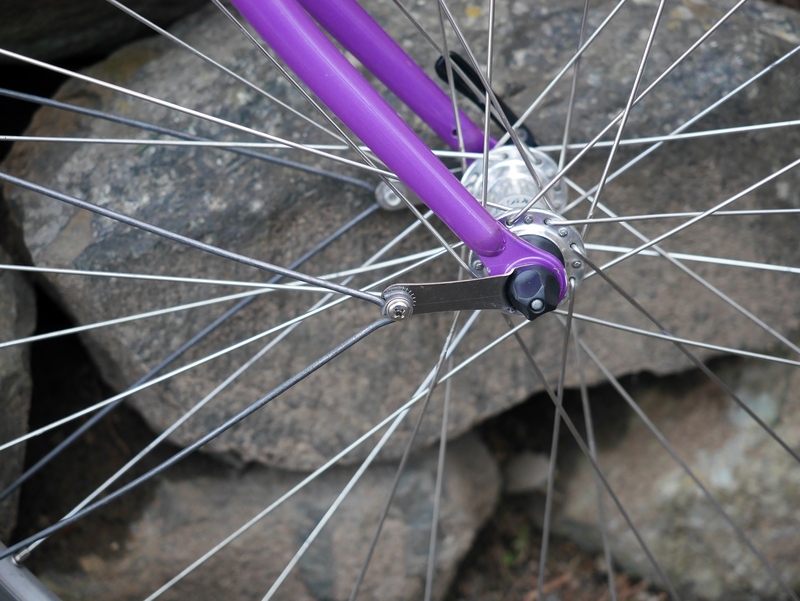 I know that some cyclists adhere to the idea that it is dangerous to have the front fender mounted securely to the fork, and use “quick release” brackets so that the fender will pop off under pressure. To me, that’s even less safe than secure mounting. And, those kind of brackets don’t work with metal fenders. 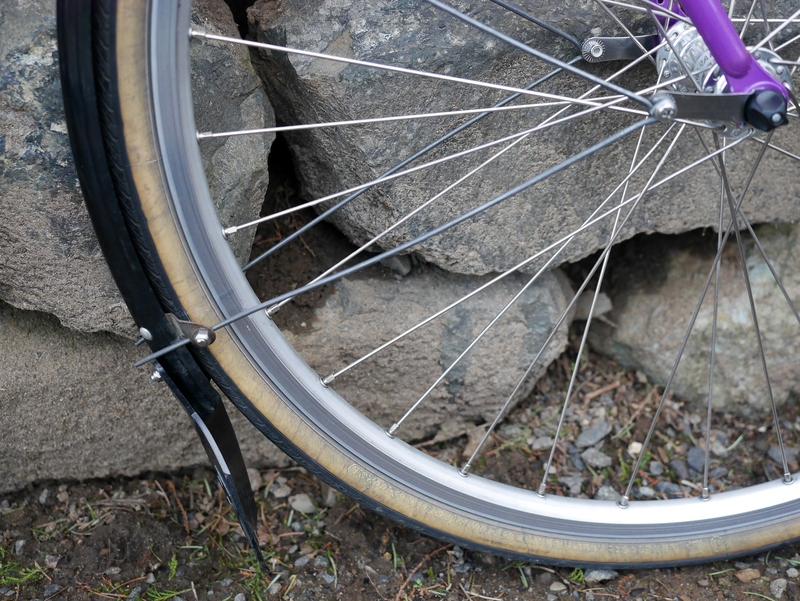 Either way, I agree that fenders are often the culprit when it comes to mysterious noises. Hope to see you out there in Pdx! I read a while ago about a young mechanic who couldn’t resist the urge to adjust the front derailer of his female partner’s bike during a steep climb in The Andes. It was rubbing a little and he realized that since he was riding a recumbent, he was low enough to simply extend his arm to trim the downtube friction lever of her bike.